The scope-of-work includes the design and construction of a new CBS 2-story, multi-bay, fully fire protected, building. The existing fire station building and parking lot is to be demolished and the existing site is to be prepared for new construction. 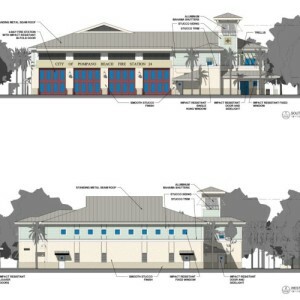 The scope of work includes construction of complete fire station facilities including all civil, emergency signalization, architectural, structural, plumbing, mechanical, and electrical components. New services and utilities will be required with connections to existing systems. New landscaping and irrigation will be required. The design and construction will achieve a minimum of Silver LEED Certification and will require full associated documentation. Incorporation of gender friendly dormitory design is required for the new fire station.